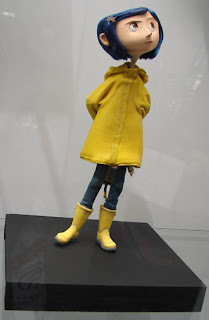 As seems to be the case with the rest of adult humanity (though I wouldn't extend a viewing to little kids), I had a wonderful time with the film version of Neil Gaiman's Coraline. I was initially hostile to references to the film that identified only the director and screenwriter (Henry Selick wearing two hats), I must admit. But Selick did morph the original, even as he morphed the characters, settings, and everything else in the project. Among the aspects that impressed me was that, as I watched the (2D version of the) film, I failed to recall that it was stop-motion animation, not CGI. I've heard some people say that they liked the slight "imperfections" that reminded them it was stop-motion; I never noticed them. And the fact that I had actually seen and photographed some of the figures (such as the one on the right) at last year's Comic-Con International: San Diego never occurred to me as I watched the film. I think the nearest 3D showing is in Madison; I'm hoping it'll still be there by the time weather permits an excursion.